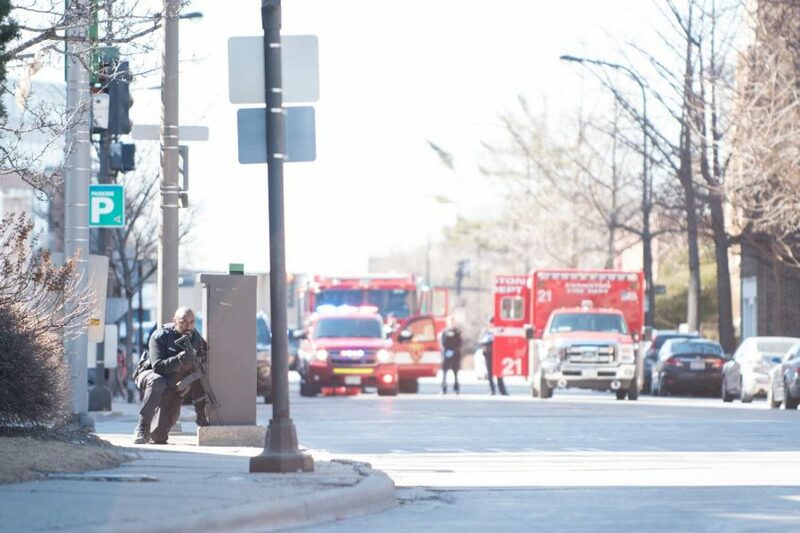 Reports of a gunman on Northwestern’s Evanston campus sent students into a nearly two-hour panic Wednesday, as they rushed to take shelter after University emergency notification alerts told people to seek safety. Though the campus went into lockdown, some students raised concerns about the sometimes conflicting reports sent out by the University. Northwestern officials said they would conduct a review of the emergency alerts system after the Wednesday episode — later discovered to be a hoax call — brought into question its efficacy in keeping people safe and informed. Medill junior Matt McHugh said he rushed to the basement of Main Library after he received the alert warning about reports of a person carrying a gun on campus. Huddled in a packed room of frightened people, he heard a widely circulated rumor that a gunman was moving toward South Campus. It wasn’t until the library was on complete lockdown that McHugh’s worries settled. That speculation came in part because the original alert omitted the incident’s location at Engelhart Hall. Though the University announced the information at 2:55 p.m. on Twitter, some students weren’t told through the notification system until more than 50 minutes after the information was tweeted. Other students did receive information about the specific location through an emergency notification minutes after it was tweeted. McCormick sophomore Dylan Kennedy said while he heard conflicting information throughout the lockdown, he stuck with trusting the University alerts through texts, emails and calls, which he saw as part of a “consistent process.” When those alerts failed to line up, though, he said he didn’t know how to proceed. University spokesman Al Cubbage told The Daily on Wednesday afternoon that a person’s phone carrier can affect when they receive the different emergency notifications. “The challenge is that you want to give information as quickly as you can, but a lot of times, and this is a good example, you just don’t have definitive information,” he said. Cubbage said Thursday that the appropriate departments — including University Police, Emergency Management, and Global Marketing and Communications — would be conducting an after-action analysis of the overall University response to the situation, including the notification system. It’s unclear how long the analysis will take, he said. Blackboard Connect, which Cubbage said has been NU’s emergency notification system for at least 12 years, sends alerts to all students, faculty and staff who have emergency contact information listed in University databases. Students are required to provide an emergency phone number where they can be reached in emergencies. He said that system, however, does not include those on campus who work for contractors, like employees for Sodexo, Starbucks or construction companies. Many Kellogg School of Management students also said they did not receive the same stream of emergency notifications as other students and staff, relying instead on social media and people around them for updates. Ankit Jain, a second-year Kellogg student, said he was in class at the Global Hub when roughly one-third of the students noticed the initial call, text or email alerts about a person with a gun on campus. Jain said a classmate who is a former Marine took charge, leading the class in barricading the doors and shutting the blinds. But while a stream of communication from the Kellogg Slack social media channel kept him in the loop, Jain said he was not receiving alerts himself. “Once things had settled down, we started asking questions,” Jain said. In a statement to The Daily, Kellogg associate dean Matthew Merrick said several students communicated concerns about the emergency notification system and that administrators recognize the communication was inconsistent. “We have already begun conversations and planning on ways to not only improve emergency communications, but to strengthen our emergency preparedness overall,” Merrick said in the statement. On Thursday afternoon, a Kellogg administrator sent an email to students asking them to add their mobile phone numbers to the emergency notification system or confirm they already have done so. Jain said a potential reason for the issue is that Kellogg students enter their contact information into a different system than most Northwestern students do, who submit their information on CAESAR. Medill freshman Amanda Rooker said she wished undergraduates also had clearer information about setting up their emergency notification alerts. Some of her friends became frustrated as continuous calls with repetitive information blocked them from contacting family members. While she understands the University might be wary of sending out details before having all the information locked down, she said she still felt like she was left out of the loop as she was panicking about the safety of herself and her friends. Gabby Birenbaum, Colin Boyle, Allie Goulding, Ryan Wangman and Alexis White contributed reporting.